Who were these guys? It’s a question I couldn’t get out of my mind after I discovered a black-and-white image in the Calhoun County Museum in Rockwell City that showed a group of well-dressed men in front of the Calhoun County Courthouse. The only identification on the image, which appeared to be from the late 1920s or early 1930s, were the words “Calhoun County Vigilantes,” along with some long-forgotten names of men I suspect were mayors and other leaders in local towns around the county. A recent trip to the fascinating “Ain’t Misbehavin:’ The World of the Gangster” exhibit at the Hoover Presidential Library and Museum helped me piece together some potential clues about the story behind this photo. While bank robbers and swindlers are as old as the banking industry itself, crime sprees shifted into high gear during the early twentieth century. As early as 1912, the Iowa Bankers Association (IBA) decried the “epidemic” of bank burglaries sweeping the state. This proved to be only an inkling of what lay ahead, however. By 1920, burglaries and holdups had increased so dramatically that new protective measures had to be taken. 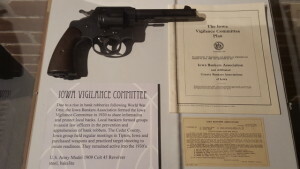 This 2016 display in the “Ain’t Misbehavin:’ The World of the Gangster” exhibit at the Hoover Presidential Library and Museum in West Branch, Iowa, explains more about vigilantes and the role of the Iowa Bankers Association.had increased so dramatically that new protective measures had to be taken. Although the Iowa Bankers Association (IBA) had previously employed the services of the Pinkerton Detective Agency and the W. J. Burns Detective Agency, the IBA formed Vigilante Committees in the early 1920s to fight the crime wave. 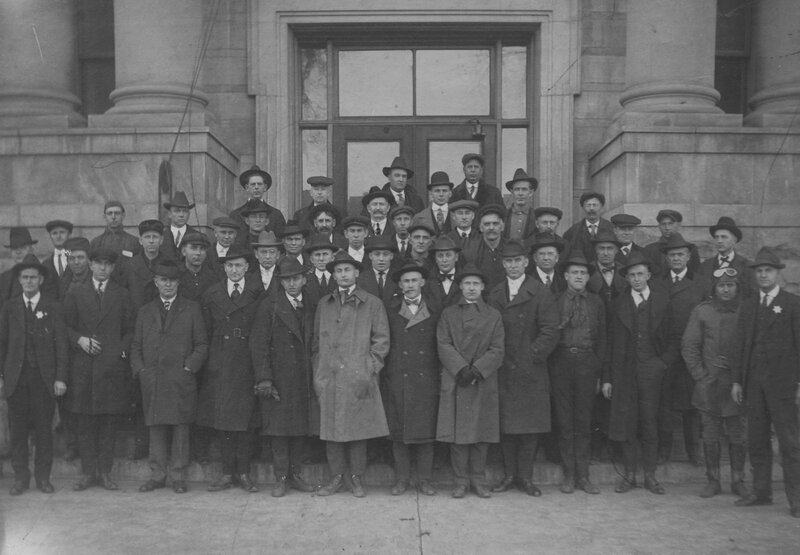 In 1921, IBA helped organize 99 county associations and a Vigilance Committee in nearly every city and town in the state to help protect Iowa’s banks. The system was a modern reincarnation of the vigilante groups who fought back against horse thieving and cattle rustling during the days of the pioneers. In Iowa, each Vigilance Committee consisted of at least four men in every town where there was a bank. Each committee member was appointed as a deputy sheriff by the county sheriff. In addition, the banks of each county subscribed to at least a $1,000 reward for the apprehension and conviction of bank burglars, plus smaller rewards for telephone operators who helped in the process. Arrangements were later made with the U.S. War Department so officers in each of Iowa’s County Bankers Associations could purchase guns and ammunition for the members of their Vigilante Committees. The Vigilance Committees were prepared for—and frequently engaged in—gunfights with criminals. At one time, there were 4,303 vigilantes covering 881 banking towns in 84 Iowa counties. “The time of easy dough for the bank bandit has passed,” noted a financial publication that commented on the plan. Insurance companies across the United States quickly adopted the Iowa Vigilance Committee Plan. A 10 percent discount for both night burglary and daylight holdup insurance rates was automatically granted to banks in any county in the United States that maintained Vigilance Committees. Iowa’s Vigilance Committee Plan continued to be of national interest for a number of years and generated coverage in a number of magazines and periodicals. As late as 1930, the IBA received an interview request from a publication in Paris, France, that wanted to feature the Vigilance Committee Plan. Though the vigilantes helped curb crime in the 1920s and early 1930s, the IBA also initiated a low-wave police radio system to bolster its crime prevention efforts. While Des Moines radio station WHO had broadcast news of bank robberies (when requested by the IBA) as early as 1924, it became clear that a radio station devoted solely to police information must be established. To connect local law enforcement officers with the Iowa Bureau of Criminal Investigation by radio, the IBA purchased a transmitter that was installed in February of 1932 in the organization’s headquarters in the Liberty Building in Des Moines. After the system was tested carefully, station KGHO began regular operations on May 15, 1933. Later, four other radio stations in Storm Lake, Atlantic, Fairfield and Waterloo (subsequently moved to Cedar Falls) commenced operations to allowed prompt contact with county sheriffs’ offices throughout Iowa. While the IBA transferred the operation of its radio station in 1937 to the State of Iowa and the organization sold its radio equipment, the IBA’s leadership in radio communication helped initiate Iowa’s permanent, statewide police radio system. 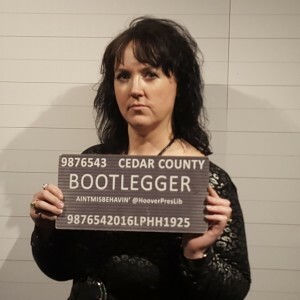 Couldn’t resist getting in on the action at the “Ain’t Misbehavin:’ The World of the Gangster” exhibit at the Hoover Presidential Library and Museum in West Branch, Iowa! Although radio communication lessened the need for Vigilance Committees, the groups continued to function. The rewards that had been offered by various County Associations were rescinded around 1938, however, as the number of bank holdups and burglaries decreased substantially. As new state crime prevention agencies developed, the suggestion was made to abolish the Vigilance Committees, so banks would no longer have to assume the expense of maintaining the committees. Nevertheless, there were 216 vigilantes who remained active in a number of counties across Iowa as late as 1949. Although the vigilantes and IBA radio stations are long gone, their legacy remains an intriguing part of Iowa history, including right here in Calhoun County. Like what you’ve seen here? Sign up today for my blog updates and free e-newsletter, or click on the “Subscribe to newsletter” button at the top of my blog homepage. Want to discover more stories and pictures that showcase the unique history of small-town and rural Iowa? Perhaps you’d like a taste of Iowa’s culture and favorite recipes. Check out my top-selling “Culinary History of Iowa” book from The History Press and “Calhoun County” book from Arcadia Publishing, and order your signed copies today.